Tradition provides the vocabulary in an Indian classical dance. When a thinking mind with a creative bent forms meaningful structures with it on stage without taking liberty with the basics, the performance pleases rasikas, connoisseurs and traditionalists alike. 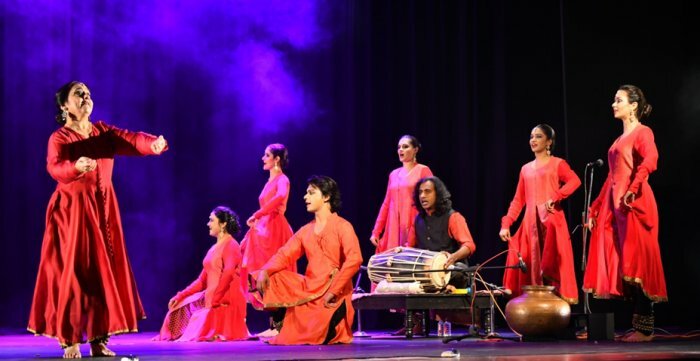 Kathak dancers and choreographers Ishira Parikh and Maulik Shah of Aanart Foundation add personal charm to their innovative style in Two is One, their new production they presented at Pt Deendayal Upadhyay Auditorium, Ahmedabad, last Wednesday to a rousing audience response. The two, presented in two parts with an intermission between them, which is rarely done in a dance performance, kept the viewers - among them eminent local artists, dancers and choreographers - enthralled. In both parts the two gurus, ever young and ebullient, danced as lead dancers with their keen disciples (Naisargi, Priyanka, Esha, Aayushi, Hitesh led by Raina and Kadam Parikh), a couple of them just budding, forming an interactive cohesive group in all smoothly flowing integrated segments. The first part Vismaya explores portraying, compactly and suggestively, with attention to the cause-effect link, the bhavas and the eight celebrated rasas they produce. Chakith, the second part, seeks to present dance movements in synchronization with varying rhythmic sounds. The anchoring source is Bharata's Natyashastra. Rathihaascha shokaashcha krodhothsaahow bhayam thathaa jugupsaa vismayshchethi - these states of the mind (prakeerthithaaha sthaayi bhaavaha) identified by Bharata with an observant eye pleasingly lead to shringara, hasya, karuna, raudra, veera, bhayanaka, vibhatsa and adbhuta rasa experiences among the spectators collectively yet individually differently perceived, each for a few moments. Rarely if ever are all the rasas together in a link produced without a rasabhanga in the Kathak style. As much as the dancers seem to behold with the vision empathy has bestowed upon them, the viewers partake of the vision with a sense of wonder (vismaya). Having assimilated the essence of the art form being pursued, an artist does not need a narrative to reach out to even contemporary art lovers not fully initiated into it. In the literary and the dramatic art, such comprehensive rasanishpatti could be relatively easily achievable with a story and inbuilt characterization. There are celebrated and could well be not commonly known other texts to prove the point. Doing it in dance without holding on to a storyline entails a decisive control of the relative technique and a thorough understanding of the concept. 'We look at ourselves,' the choreographers recently asserted, 'as a bridge between the past and the future.' Breaking from the katha-ka origin of the form, putting aside in Two is One a narrative, they explore bringing the concept of Rasa home to the modern viewer without straying from the tradition and at the same time not appearing clichéd in their portrayal of the respective bhava. Vismaya, suggested with so many pairs of eyes, becomes the recurring motif. A cultivated sensibility bestows a performing artist with an all-pervading empathetic human vision - distinctively different from Sanjay's divine vision - that enables him/her to see the world with compassion. Subtle suggestions made during the portrayal of the rasas exhilarate. 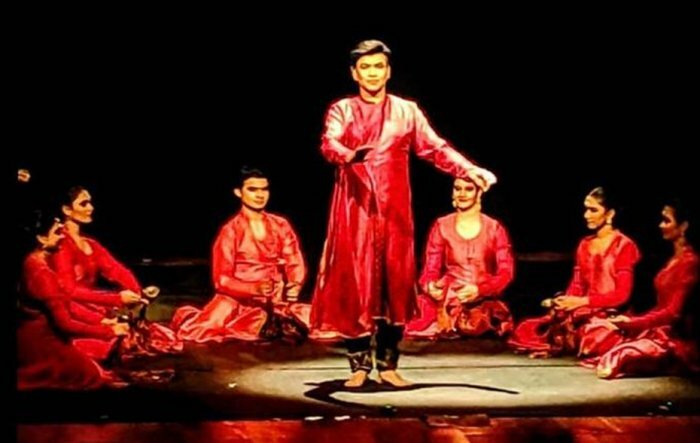 A subdued Kara singara bethi brijabala... with six pretty dancers elegantly sitting in a row underscores the complementary role poetry with music plays in projecting the mood of shringara. Tactile signals grow connotatively rich in karuna. Accusing fingers along with the withdrawing evil force appropriately signify a contemporary social context. Hasya can be produced innovatively in an unconventional style, not necessarily with the focus on an uncontrollably laughing visage. 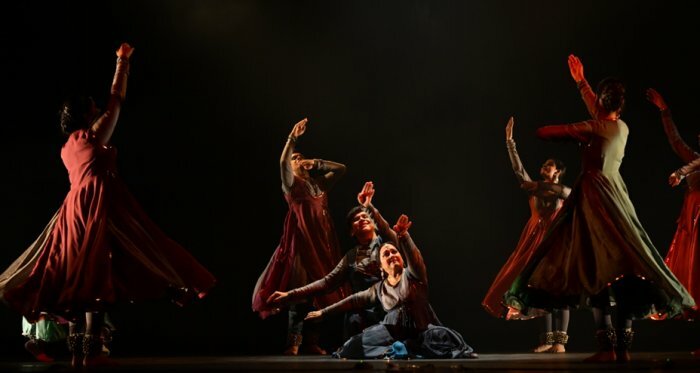 Rasa-specific colours such as red daring and repulsing the evil and dark for the wicked have dramatic significance as well in a dance performance. Lights (Gyandev Sing; Parth Raval) and costumes (Anuvi Desai) make a thematic contribution, so does music (Niraj Parikh). Classical dance and musical rhythm are umbilically connected. Chakith, the second part of Two is One, retains the element of novelty in getting dance movement attuned to varying rhythmic sounds and innovatively celebrates the thematic triumph of Vismaya. The rhythmic beats flow now from the mridanga, now the guitar and drums, now dainty cymbals, now from claps by so many pairs of hands, now from a metal pot maan, Gujarat's indigenous percussion instrument akhyaan narrators use. Tiny Kathak ghunghru bells keep tinkling on the dancers' ankles. Clusters of dancers bloom in exhilarating fresh formations. Unaware perhaps, Maulik plays conductor without a baton in hand! Emerging endearingly in the centre, in a stylized fashion with hand gestures on one hand he invites, one after another, instrumentalists (mridang, Joby Joy; Nishant, drums; Jignesh, guitar) and a vocalist (Prahar Vora) all on stage ready to respond with their beats and tunes. On the other, he turns to the irrepressible dancers, gently invites and directs them and cheerfully keeps up the tempo engaging the two skilled groups in delectable jugalbandis. An even more enduring image of the evergreen dancer-choreographer that emerged in this part was when he sat in front of a maan made of a lustrous yellow metal and ardently played it on its large bloated circular part, producing fascinating beats. Two is One skips storytelling but strongly retains rhythm that is central to the dance form. 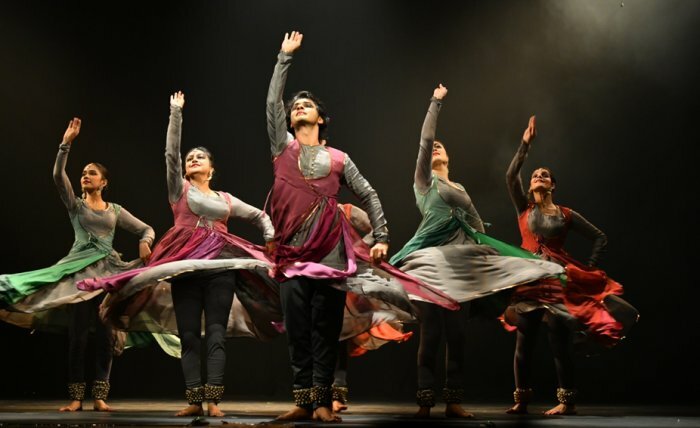 The production projects two fresh approaches to Kathak for contemporary classical dance lovers. Two dancing couples, including the ever young gurus, steal the limelight. Can't easily recall a single Kathak dance performance in two parts and yet everyone remaining glued to their seats. A fully packed house giving a warm standing ovation at the end was a sight to behold.